To many who hear, the deaf world is as foreign as a country never visited.Deaf Worldthus concerns itself less with the perspectives of the hearing and more with what Deaf people themselves think and do. Editor Lois Bragg asserts that English is for many signing people a second, infrequently used language and that Deaf culture is the socially transmitted pattern of behavior, values, beliefs, and expression of those who use American Sign Language. She has assembled an astonishing array of historical sources, political writings, and personal memoirs, from classic 19th-century manifestos to contemporary policy papers, on everything from eugenics to speech and lipreading, the right to work and marry, and the never-ending controversy over separation vs. social integration. At the heart of many of the selections lies the belief that Deaf Americans have long constituted an internal colony of sorts in the United States.While not attempting to speak for Deaf people en masse, this ambitious platform anthology places the Deaf on center stage, offering them an opportunity to represent the world--theirs as well as the hearing world--from a Deaf perspective. For Deaf readers, the book will be welcomed as a gift, both a companion to be savored and, as often, an opponent to be engaged and debated. 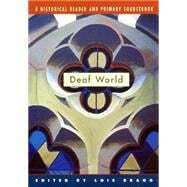 And for the hearing, it serves as an unprecedented guide to a world and a culture so often overlooked.Comprising a judicious mix of published pieces and original essays solicited specifically for this volume,Deaf Worldmarks a major contribution. Who Speaks for the Deaf Community? Not Who You Would Think! Black Signs: Whatever Happened to the Sign for ``Cornbread''? Traditions: Hispanic, American, Deaf Culture: Which Takes Precedence in Trilingual Interpreter Training? Who's Itching to Get into Mainstreaming? Do We Continue This Tragedy? What Exactly Am I Supposed to Overcome? Can Deaf People Survive ``deafness''? Cochlear Implants vs. Deaf Culture?